Early this month, for the first time ever, I got up during the screening of a film just to buy popcorn. Granted the screening in question was Jupiter Ascending and this particular stage of the film was becoming an excruciating watch, I still felt like I had to report myself to someone and then step into a shower and wash away my guilt and shame. However, I am always on my best behavior in cinemas save for the rare ambient glow from my tablet when I make notes and even that I am slowly cutting down on. I can proudly say I, for the most part, adhere to general codes of conduct in movie screening but the people I share movie theaters with, no so much. I don’t know what it is and maybe it’s my ever growing reverence for the medium of cinema coupled with my older age but certain things seem to be getting on my nerves more and more. Before I go on though, what is this code of conduct and who stipulates it? 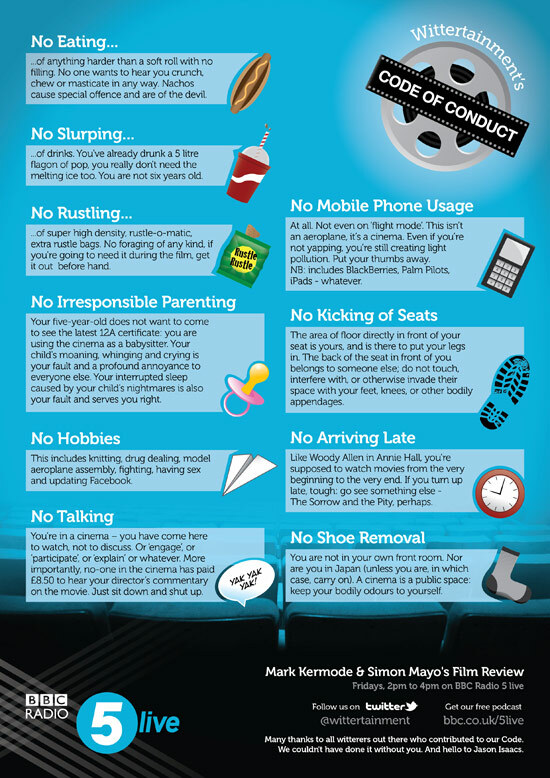 Well Silverbird cinemas provide the prime screening joints in Ghana but they don’t really have any hard and fast rules to go by as far as cinema etiquette is concerned. The first couple of items on the Wittertainment list deal with food and drinks and I generally agree with them. People crunching away at their Pringles when a film is on can be a tad annoying so yeah, no crunchy foods. I will admit I have had some crunchy snacks during screenings but the thing is I always finish whatever snack I buy during the long annoying ads no one pays attention to. By the time the movie starts whatever snack, crunchy or otherwise, is finished. As for slurping away at drinks, I find that quite uncouth and annoying but I can’t ever recall hearing someone slurp away during a film but it’s still a no no. When I saw the much loved Frozen over the holidays 2 years ago, the screening I was in was so full of young kids and their parents I was starting to feel weird. They were running around, singing along with Olaf and generally having a good time which was in truth adorable and great with the young ones enjoying the cinema experience. However, when I’m sitting in a screening of Snowpiercer, I don’t expect to see kids running around because it’s an R rated film and parents have no business bringing their kids along. I refuse to suffer because you couldn’t find a sitter. Just stay at home. I have a long tale about how toddlers marred my screening of X-Men; Days of… but that’s a story for another day. Bottom line: thumbs up for toddlers in U or PG rated films, massive thumbs down for them in higher rated screenings unless their parents brought them along with a leash and a muzzle. Put the damn thing off! It’s that simple and saves everyone from unnecessary irritation. How some folk have the nerve to answer or make calls during a screening, I do not know and I have seen it happen. As for tweeting, texting and the like, I wont pretend to be overly irritated by it but it can be distracting so unless you are sitting in the highest row you shouldn’t be playing on your phone, just focus on the film. Bottom line: treat the cinema like church and put your phones off unless you do not put your phones off church then just keep them silent and no calls. Shut those traps people, pure and simple. Moviets – tongues remain tied and opinions stay in your heads. As for cheering during, say, action movies – a no to that too and I’m looking at that girl in the Captain America screening who spent the first 20 minutes yelling how much she liked Chris Evans. Maybe like 3-d glasses, we should hand out muzzles at the doors. Lord knows a silent cinema is just as important as an enhanced visual experience. Bottom line: To be on the safe side just keep your mouth closed for the duration of the film. Arriving late to a screening isn’t beyond the realms of possibility so that doesn’t irk unless it’s 5 minutes to the end of a film even though I could ask why you would purchase a ticket you were late for. However people getting up to pee or buy drinks or take calls are so distracting and infantile. Some kids comport themselves better than some of the adults I’ve seen get up to buy drinks twice during a screening. One last thing; no switching seats during the film – it’s annoying as hell. Bottom line: Emergencies notwithstanding, keep you bums in your seat for the duration of the film.